In 1918 Mr Sydney Dean Roberts purchased from John Barrett part section 135 Hundred of Dublin comprising one acre and thirty perches with a frontage to the Calomba Railway yard. Mr Roberts acted as a wheat agent at the newly formed Calomba Railway siding but for only one season before selling in 1919 to Mr Heinrich Goedecke – a shop assistant from Hamley Bridge. Mr Goedecke developed the Calomba Shop and also the postal services which officially started in 1920. There was a quick change of ownership over a span of a few years but in 1923 Mr Sydney Robert Good purchased the store, postal services and wheat agency and remained in the business for twelve years, following which he purchased Barrett's chaff business in the settlement of Calomba. In 1935 the Calomba Store, Post Office and Wheat Agency were purchased by Mr Allan Gale and Mrs Ruby Gale. This was a busy time for the owners. Mrs Gale served in the Shop and Post Office and also worked the telephone exchange which was located in a small corrugated iron addition off the side of the shop – very hot in summer and freezing in winter! It was a manual exchange and Mrs Gale had to connect the callers on the single line or the party line. There was no electricity so to keep produce cool Allan Gale built a dairy which was excavated into the ground with a roof over it. Kerosene lamps were used for lighting plus candles when required. Mrs Maureen Parker (nee Baker) recalls:"I would stay with Aunty Ruby Gale and Uncle Allan during many of the school holidays. 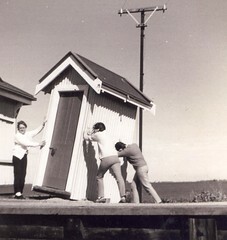 As well as her work in the store Ruby Gale would on occasions catch the early morning train to Adelaide. She would take with her a very large suitcase and visit various warehouses e.g. G & R Wills, Goode, Durrant & Murray and Coles. She would purchase or order items such as linen, crockery, glass ware and stationery etc. She would fill the case and haul it home on the 4 o'clock “Barwell”. Nearing Christmas time additional items would be purchased such as gifts and decorations for sale in the store. On one day each week Allan Gale would leave home very early and drive his empty motor lorry to Port Adelaide. He would visit the warehouses buying groceries, hardware, kerosene and requirement for the farmers. He would also go to the markets to purchase fresh fruit and vegetables for the store. At times, on his way to Adelaide, Allan would have his truck loaded with saleable goods to deliver for the farmers. He also had his Wheat Agency duties to perform''. Maureen continues: “When I was 14 years of age I spent three months helping Aunty Ruby at the Calomba Store and I also assisted in the Post Office helping to sort and stamp the mail. When all mail had been placed in the large canvas bags, sealed with red sealing wax and the warm wax stamped with the “CALOMBA” stamp, I would walk to the siding, wait for the midday train and give the bags to the guard.”' In 1944 Mr and Mrs Gale sold the business to Albert Henry Stewart who owned it for two years. In 1946 Mr John Howard and Mrs Elizabeth Howard (Jack and Betty) purchased the business and so began a period of ownership by the Howard family which lasted for twenty eight years. On January 22nd 1948 on a very hot windy day, a fire started on the railway corridor near Kallora with a spark from the coal fired train. Val Clark of Avon spotted the smoke about midday when taking the mail bags to Avon Station to place on the train. Everyone in the vicinity was alerted via the manual switchboard. The fire quickly reached Long Plains and every available man was there trying to save the town including the men from Calomba. The fire raced to Calomba and 20 women and children sought safety in a fallow paddock while the flames passed around them. 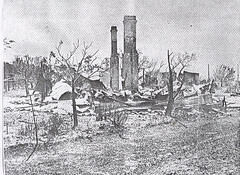 The Calomba Store and Post Office, residence and sheds were completely destroyed. The only persons in the building were Mrs Betty Howard and a young female assistant who had to run and seek refuge in the paddock when the outer sheds burnt down and the house and store caught alight. The local people praised the efforts of a small squad of R.A.A.F. personnel from the Mallala Training Base who attended with their fire truck and vigorously fought the flames to save some houses and also the wheat stacks which held the district's harvest of 50,000 bags of grain. The following day the Advertiser quoted Mr Jack Howard as saying: “We will build things up again. As agent I have continued to receive wheat and barley today. 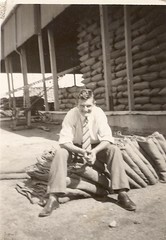 More than 500 bags were delivered.” The Chaff Mill owned by Mr Syd Good was razed but the RAAF squad saved his home. Mr Good was away from home but his wife successfully moved ten dairy cows to safety before getting herself to the fallow paddock and collapsing. 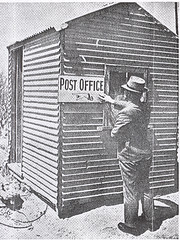 The Postal Department technicians were at the Calomba siding the next day and soon erected a very small shed to serve as a temporary post office. 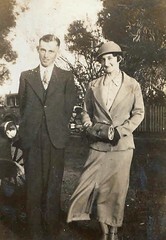 Tony Howard married Winnie Daniel in 1949. They lived with Jack and Betty for a while before renting a farmhouse near by. As well as his other duties Tony studied by correspondence to be a motor mechanic then in 1960 he purchased a big shed at the auction of the Mallala Aerodrome and the shed was placed at the rear of the shop and became a mechanic's workshop. Tony serviced all of Ira Jenkin's diesel trucks. He also had an agency with the “Neptune Fuel Company” and he delivered to his customers petrol in 44 gallon drums as well as oil. Winnie ran the store and Post Office. The shop stocked mainly groceries but customers would place an order for bread and it would be delivered by the Mallala baker Mr Ted Algar. Tony would drive his truck to Adelaide to collect groceries and other goods as required." The manual switchboard was open from 9 am to 8 pm and could be opened for emergencies only after that time and would be plugged into the Mallala switchboard. With only one outside line it was difficult to make a trunk call. Like her predecessors Winnie had to meet the 9 am train to collect the mail bags and papers and later in the day be back at the station to hand over the outgoing bags of mail. In 1957 Tony and Winnie took over the management of the business from their parents Mr & Mrs Jack Howard and then purchased the premises in 1965. They served the community until 1974 when the business was sold to Mr Robert Francis Daniel and Mrs Jennie Marie Daniel. They managed the business for only a short period of time before the store closed and the Calomba Post Office officially closed on January 19th 1975. 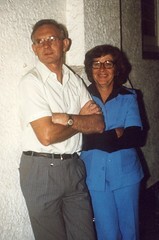 Mr and Mrs Daniel sold the premises in 1976 and it became a private residence. It remains so in this year of 2013. In 1918 Mr Sydney Dean Roberts established a wheat agency at the Calomba Railway Siding. The successive owners of the land combined the wheat agency with managing the Calomba Store and Post Office. 1976 – The premises were sold and they became a private residence. Calomba Store and Post office destroyed in the 1948 fire. 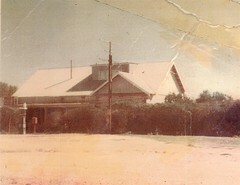 The Calomba Store and Post Office was rebuilt after the disastrous fire in January 1948 by the Howard family. 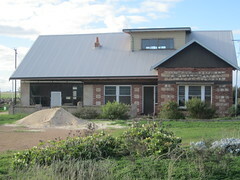 The former Calomba Store and Post Office is now a private residence. Paula remembers: I remember buying our tins of Arnotts bickies in the shop and a nice pair of blue plastic sandals. We received our mail at Calomba and occasionally walked to the shop to get the Advertiser. We also caught the train there to go to Adelaide quite regularly as kids. Do you remember Calomba Store and Post Office ? Then Join up and add your memory here.